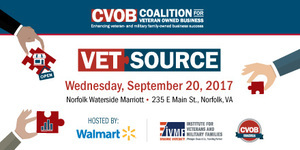 NORFOLK, Va., Sep. 20 /CSRwire/ - Today, Walmart and the Coalition for Veteran Owned Business (CVOB) are hosting a first-of-its-kind event, VetSource, to support the success of veteran, military and military spouse-owned businesses by connecting them to several Fortune 500 companies in one day for procurement opportunities. Walmart has a long history of supporting members of the military, veterans and their families.As part of its Veterans Welcome Home Commitment, the company has hired more than 179,000 veterans since the initiative was announced in May 2013, and of those hires, more than 24,000 have been promoted to jobs of greater responsibility. Walmart recently announced major changes to its military leave of absence policy, offering differential pay to associates for any military assignment, including voluntary service like basic training, allowing associates who are considering enlisting in the armed forces to do so without fear of losing wages. In addition, since 2011, Walmart and the Walmart Foundation have pledged a total of $40 million for veteran reintegration programs through 2019 to help address challenges many veterans face when returning to civilian life. Wal-Mart Stores, Inc. (NYSE: WMT) helps people around the world save money and live better - anytime and anywhere - in retail stores, online, and through their mobile devices. Each week, over 260 million customers and members visit our 11,695 stores under 59 banners in 28 countries and e-commerce websites in 11 countries. With fiscal year 2017 revenue of $485.9 billion, Walmart employs approximately 2.3 million associates worldwide. Walmart continues to be a leader in sustainability, corporate philanthropy and employment opportunity. Additional information about Walmart can be found by visiting http://corporate.walmart.com on Facebook at http://facebook.com/walmart and on Twitter at http://twitter.com/walmart. The CVOB is the first-of-its-kind national initiative, which supports the success of veteran, service member, and military spouse-owned businesses by connecting them with entrepreneurial education and training, small business resources and solutions, and commerce and supplier opportunities. Through the commitment of our Fortune500 stakeholders and partners, the CVOB aims to increase opportunities and information for the veteran and military spouse businesses within corporate supply chains. The CVOB continues to drive awareness and commerce opportunities for veteran and military spouse businesses in the public marketplace, create networking opportunities for veteran-owned businesses (VOB) and large companies, provide educational resources, and contribute to veteran and military employment. For more information, please visit: http://veteranbusinesscoalition.org/.